In a fashion we should probably be accustomed to by now, Blizzard effectively kickstarted an entire genre when they launched Hearthstone back in 2014. Three-and-a-half years later, the card game finds itself growing a legacy that mirrors the situation with World of Warcraft in its prime years – many contenders, but only one crown, and nobody even pretending they’re going to take it any time soon. 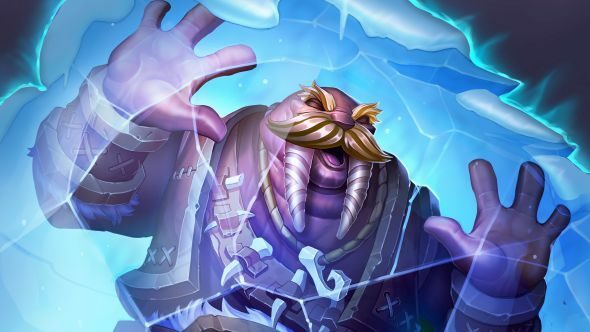 Despite that dominance, Hearthstone, now with the Knights of the Frozen Throne expansion, still struggles with problems it’s had since launch. Check our guide to the best Hearthstone decks. In its initial form, Hearthstone directly targeted the biggest issues that had faced Magic: The Gathering – then market leader – and its predecessor, the real-world World of Warcraft TCG. Not drawing the right combination of resources and spells is frustrating, so Hearthstone has one mana crystal per turn. 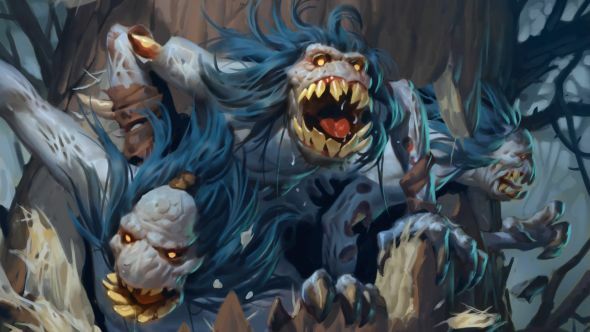 Those resource cards are used to pad out larger decks, so instead, Hearthstone introduces a two-card maximum on 30-card decks, sharpening focus and making deckbuilding understandable for more casual players. One of the difficulties Blizzard found when digitising an interrupt system of responding to your opponent’s actions was that it slowed everything down and made it impossible to add that free-flowing polish the company’s known for. So they dumped the lot, replacing them with Secrets and other auto-triggering effects. Part of what creates the mass appeal of card games is that they are simple. No manual dexterity is required. Beating other players comes down to deck-building, playskill, and luck of the draw. While nobody’s able to control whether you draw that Fireball on time or not, the former two are heavily and directly influenced by how many people are playing and talking about the game. Perhaps the greatest threat to Magic’s success over the years was the internet. Ten years after the game was first developed, it suddenly became possible to ‘netdeck’ – using the internet to crowdsource a winning deck. It changed everything for the invested player, going from Wizards of the Coast actively hiding what cards were in a set to keep a sense of mystery, to publishing full spoiler lists. The best players were more than willing to put their deck building ideas out there for a paycheque, and only just before the most competitive tournaments was there a fear of spreading information to potential rivals. But this side of playing Magic can be avoided. The non-competitive and more casual players can and still do play what is known as “kitchen table Magic” – playing with whatever cards they have, often in multiplayer with a group of friends. When a community is as large, loud, and well-supported as the millions-strong Hearthstone one, you’re practically falling over websites, streamers, and YouTubers trying to tell you what you should play. The problem for Hearthstone is there is no kitchen table. There is no way to play these just-for-fun, four-to-six player, free-for-all games. Hearthstone doesn’t support the social politics, backstabbing, and chaos that stops these games always being won by the most powerful deck. You can’t gather a few laptops or iPhones around for a drunken evening and just have a nice time together. What we’re left with is a hole that could do with being filled – there’s no place in Hearthstone where you can simply throw a deck together and have some fun. Play just ten matches on the ladder and you will run into someone with a tuned, powerful deck made up of the best cards in the game. With so many people dropping in and out of play over time, many – myself included – have low-ranked accounts with massive collections, able to throw together whatever deck they find online. Meanwhile in Arena, every single card picked can be deliberated and compared with online sites and custom in-game overlays, to the point that almost any original decision making is taken out of the process entirely. Easy to learn, easy to master? All of this is compounded by the decisions Blizzard made to create a game that was so very accessible. 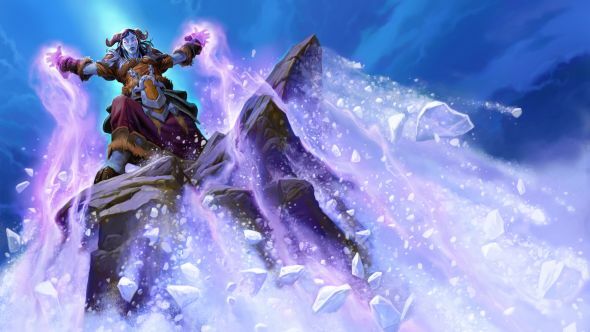 There are tactical decisions in Hearthstone, and some of its best decks have been some of its most challenging to play, but the skill drop-off to its simpler decks is not matched by a drop in win rate. 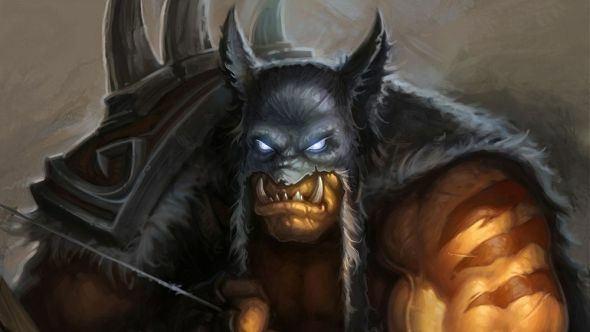 Things are not as bad as they once were – ask a Hearthstone old-timer about trying to beat Face Hunter and they might faint – but it’s still a problem. 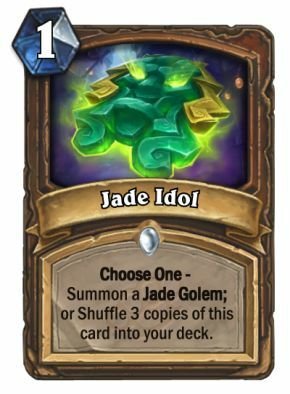 The current boogeyman, Jade Druid, is an old core made overpowered by new additions. Both the set it came from, Mean Streets of Gadgetzan, and the Knights of the Frozen Throne that turned it into a major problem, looked perfectly innocent in concept – very little focus was put on the deck’s key cards during preview season. It is only after the combined might of the internet smashed itself against the complex equation that is finding a best deck that this relatively simple-to-play deck became oh-so-obvious. And because this information is out there, because there are a dozen Reddit front-page posts about it a day, because every one of the multi-thousand-concurrent streamers is either playing Druid or trying to beat it, it stops mattering whether it’s easy to play or is even that good. The average player, at any rank, so long as they have some or all of the cards required, is going to pick what they’re being repeatedly told is the best. Outside of actual gameplay, that click-’n’-play quick-start nature of laddering also helps to foster this. With no in-game sideboarding system, official tournaments run on multi-deck formats, meaning every player is bringing Druid, and every player is not expecting to have to play it thanks to the ban system. While in Magic the public perception is controlled by an endless number of completely open, multi-round tournaments, it’s harder to alter that in Hearthstone where the format is so different between average players and the elite. Again, there is also no support for casual games at home, with the still-young Fireside Gathering program angling in that direction, but still being focused on larger events. Further complicating this issue is Blizzard’s extremely slow balance cadence. 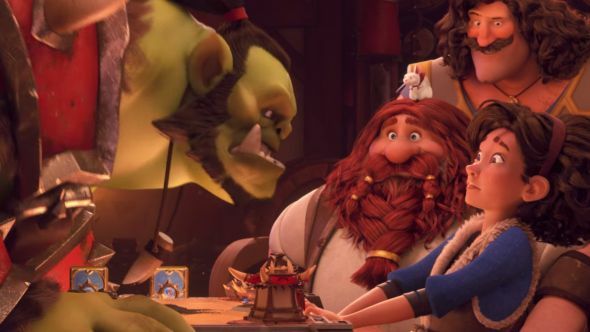 Mistakes are forgivable – no card game has ever had the playerbase size that Hearthstone does, and any of them would have fallen over under the pressure of so much scrutiny, particularly so early in their lifecycles. But the pace of fixing those mistakes has always been a sticking point. Blizzard argue that reacting too quickly takes away from the discovery and adjustment elements of the game, already so impacted by the huge playerbase and free flow of information. Previous card game developers couldn’t even change their cards, being physical pieces of cardboard printed months before, limiting them to either banning problems that emerged once the cards were released, or riding out the storm. But what Magic, and others, do have is regularly scheduled times when those in charge will announce whether they’re making changes or not. People know when that communication will be offered, and exactly how long they’ll have to wait for obvious problems to be fixed. This doesn’t make banning cards – or, in Hearthstone’s case, changing them – any easier, but it does give a focal point for people’s patience. If you know that, say, on September 14 you will get your answer to The Druid Problem, you’re going to be a lot happier about dealing with it in the meantime. The fact that the Hearthstone development team rarely acknowledge the problems is what causes the frustration. The combined truth of all of this is that Blizzard built a game that is no longer fit for its audience. What they made was genius for bringing in a crowd: the bright colours and welcoming universe of Warcraft; the chunky, simple interface; the OTT voice acting – all of it was, in hindsight, guaranteed to be a hit. However, the game’s design doesn’t work with a community of this size and activity. The dream scenario of opening a couple of packs every so often, crafting your own deck, and learning from an opponent’s synergies falls apart in the wake of Google and being a top-five Twitch game all day, every day. The random and sometimes hilarious card design philosophies aren’t appreciated when so many are playing so competitively. Simple, easy-to-use designs are great for pulling people in, but if it lands them in a place where they simply cannot compete, it doesn’t work. New sets should bring further excitement to developing decks and strategies, but after the initial hype, the average player is back to watching streamers build decks they can’t afford, to ineffectively fight the same cookie-cutters they’ve seen a thousand times. Here’s a terrifying thought: there may never be a solution to this. 20, 50, 400 developers will never be able to effectively design for a community of millions in a solvable environment. New cards and new adventures will always be fun, and Team 5 are doing a better and better job of creating interesting puzzle pieces each time, but eventually the people reach a consensus. At that point we’re back to haves and have-nots based on money invested. However, Blizzard have never been scared to completely redesign a game if fundamental problems reveal themselves. Heroes of the Storm was stingy, so they completely changed every core monetisation system. World of Warcraft’s talent trees encouraged people to use cookie-cutter builds, so they were ripped out after eight years – a change that’s still controversial. Hearthstone players shouldn’t worry about their game dying, but how they play it may be completely different in 12 months.